This an original 1878 printed edition by Donnelley, Loyd & Co. Publishers. Rebound 1878 edition. Bookplate on page. Preface page has whited out note at top of page. Fold out color map is loose. Inside pages are overall nice and clean. This book consists of the history of Logan County from its first settlement and continuing up to 1878. The War Record section of the book includes lengthy rosters of soldiers who served during the Civil War. The Biographical Directory portion includes an extensive listing of residents of Logan county organized by township. This section also includes biographies for many individuals and families. Numerous illustrations and engravings are scattered throughout the book. 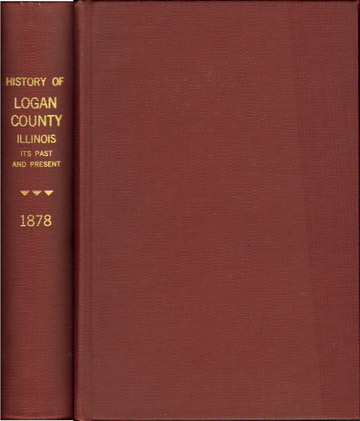 Includes the original full color, fold out map of Logan County which shows the location of the county seat (Lincoln), plus numerous towns and location of each township.